Discussion in 'POTW Collaboration' started by Serebii, Mar 3, 2019. 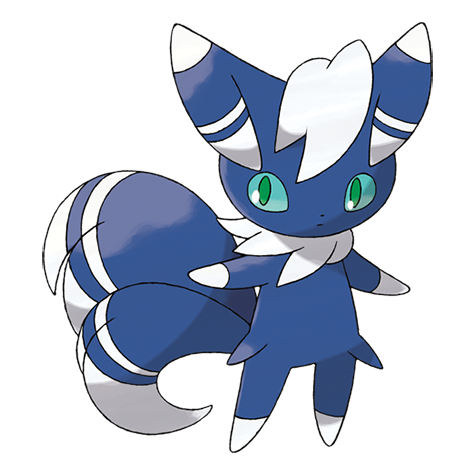 This week we have the cat Pokémon with different features based on its gender, Meowstic! Meowstic, the ace of the psychic type gym leader Olivia... really? Many Gym leaders were screwed over in X and Y where Mega Pokémon often smoked their aces in raw power. Meowstic is not exceptionally bulky, nor is it exceptionally powerful. So what leaves it to define itself? Ability and movepool. Male Meowstic gets the fantastic Prankster ability, while Female Meowstic gets Competitive, which would be great on something with a little more oomph than female Meowstic... but in any case, both have the movepool to get some mileage out of these abilities. This Meowstic abuses Prankster for all its worth. Played correctly, this Meowstic can shutdown two Pokémon on the opponents team, by tricking an inappropriate Choice Item and putting another to sleep with Yawn. Yawn also provides Meowstic a way to safely switch out without giving the opponent a chance to setup and can function as pseudo hazing. After this moves are up to preference. Thunder Wave is good speed control, Toxic give Meowstic some offensive capability and most walls that aren't immune hate Toxic. Heal Bell enables Meowstic to play Cleric for its team. Prankster Dual Screens are always fantastic. Note that Prankster does not work on Dark types (at least in regards to offensive ones like Trick, Yawn, Thunder Wave, and Toxic) and if that Dark type carries Pursuit, your Meowstic will all but be sacked. Gravity -always a fun move, though does not synergize well with Meowstic on its own. Best paired with a STAB Earthquake user. Misty Terrain -Safeguard + Dragon resist. Dark Types -barring Signal Beam, Meowstic can't handle Dark types at all. 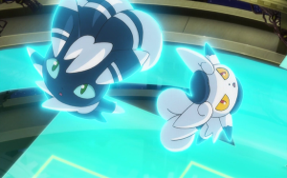 Prankster Meowstic can't properly utilize its moves on Dark types barring setting up, while Competitive Meowstic would need to run Signal Beam (and pray for a OHKO) in order to avoid being walled by most Dark types. Meowstic is too frail to take a STAB super effective attack from anything not using Foul Play as its STAB move. Priority -Meowstic is admittedly fast and is difficult to outspeed. However, low defense and HP makes them rather open to revenge killing from priority move users (except Vacuum Wave). Sucker Punch is especially potent. However be wary with Prankster Meowstic in which case you will still need to outspeed it with any move bar Extremespeed. Special Walls -Meowstic has no physical offense to speak of making Special walls as safe bet for the most part. Articuno, Spiritomb, and Regice all wall Meowstic with ease. 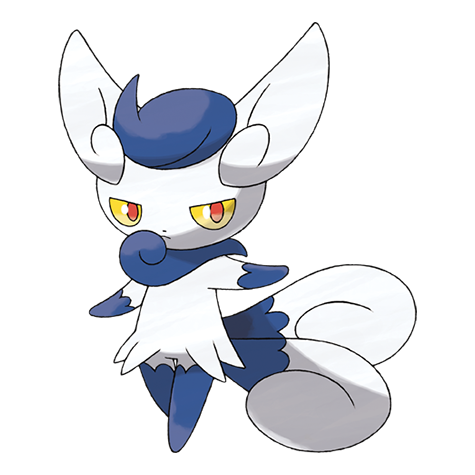 However, they should be wary of Trick, as that will be crippling to all of them if Meowstic tricks the right item. 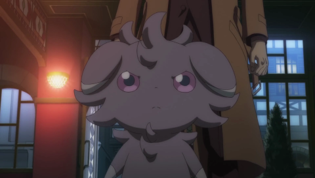 This is one of the cases where the evolution line is more well-known for it's pre-evo than it's final-evo and for this case it's none other than Espurr who is often viewed as both one of the creepiest and cutest Pokemon ever to be created. The most famous trainer to ever own a member of the Meowstic Evolution Line is none other than Emma who worked for Looker as an assistant or possibly more familiarly as the brainwashed test subject, Essentia. Emma owns an Espurr that truly care for each other, having making an appearance in Pokemon Generaitons where Espurr valiantly stands up to Essentia, wanting her trainer back. In Pokemon Adventures, in the epitome of cuteness, we see Emma following the main heroes after Mimi the Espurr secretly enters their Kangaskhan's pouch, befriending the baby Kangaskhan. As for Meowstic, it's well-known to be Olympia's very own signature Pokemon which made quite a huge impression on viewers during their Future Sight battle against Ash. There's also the trainer Astrid who also made quite an impression with viewers who utilized a female Meowstic to battle Ash. Pretty straightfoward. Slows down enemies, heals statuses. Fake-out enemies. Also pretty straightforward. Reflect and Light-Screen support. This is one of those sets where you adapt to new situations with or without Choice Spec/Choice Scarf. With the Choice items, you can go on the offensive. Without it, you can use Calm Mind and spam that Thunder Wave. Gonna be hoenst. I think Meowstic's competitive ability may work better as a lead in doubles because you have a higher chance to find intimidate spammers On the other hand though, Meowstic is a very frail Pokemon with a limited moveset and looks like it works more in Singles. Anyways, this is the stored power set. Straightforward. Yawn a target. Use Calm Mind if they switch-out or they don't. If they don't, lucky you. You got a Dream Eater target. Also HIdden Power Fighting in-case you encounter any Dark-types.